I first saw these cupcakes on Denise's blog and I found myself practically drooling. And then I saw that the recipe comes from a cookbook I actually own, Martha Stewart's Cupcakes, and I knew that I had no excuse not to make these delicious little delights immediately. So that's exactly what I did. These were sooooo good -- creamy, decadent, rich, and delicious. And addictive, too! I'd eaten three before I even knew what I was doing. Needless to say, they disappeared very quickly. They're so easy to throw together and bake up in no time, and they taste really special. 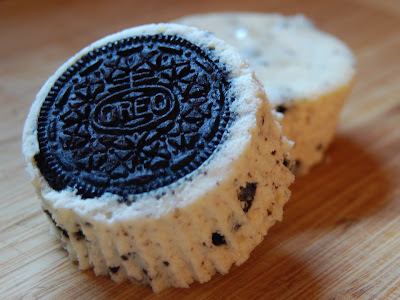 Next time, I may try making them with peanut butter Oreos -- or even mint Oreos during the holidays. You're going to love these! 2. Line standard muffin tins with paper liners. Place one whole cookie in the bottom of each lined cup. 3. With an electric mixer on medium-high speed, beat cream cheese until smooth, scraping down sides of bowl as needed. Gradually add sugar, and beat until combined. Beat in vanilla. Add eggs, a bit at a time, beating to combine and scraping down the sides of the bowl as needed. Beat in sour cream and salt. Stir in chopped cookies by hand. 4. Divide batter evenly among cookie-filled cups, filling each almost to the top. Bake, rotating tins halfway through, until filling is set, about 22 minutes. 5. Transfer tins to wire racks to cool completely. Refrigerate in tins at least 4 hours or up to overnight. Remove from tins just before serving. 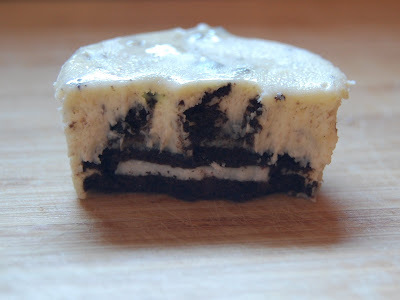 I'm seeing these all over the cooking blogs..I need to add these onto my must make list. They have mint and peanut butter oreos?? I've been gone way to long. Cassie.. these look gorgeous. They are also on my list to try. Great idea mint oreos for the holidays! those little bites of heaven look positively incredible!!! wow! !